Celestron CG-5GT tripod is a sturdy tripod built for heavier types of telescopes. The steel legs provide a very firm position which gives you extra security: even during windy nights you could go on the road with your telescope for a series of observations. 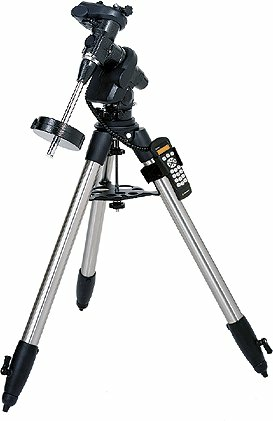 In addition, this Celestron tripod is easy to set up and, thanks to the All-Star application, very easy to align. This tripod is standard equipped with motors and a GoTo hand controller. The hand controller holds about 40,000 objects including planets, stars, double stars, variable stars and user objects. The hand controller is easy to update via internet, so you will always be up to date. The stand is equipped with an Autoguider port for slow shutter speeds. This improves the quality of your picture. You can also use the RS-232 port on your hand controller to direct your telescope through your personal computer. The remote control is equipped with a 16-character backlit LCD display. This tripod can also be upgraded to GPS. This allows for even faster and easier alignment. The stand is made of solid steel and able to carry telescopes of up to 35kg. Write a review By sharing your experience with the Celestron CG-5GT Tripod, you can help others (perhaps still doubting customers) with making a good choice.